In this week’s digital news roundup, we’re talking about the how YouTube are facing up to their conspiracy theory issues, why Instagram and Snapchat pulled Giphy, and a whole host of Google Maps newness that’s set to make life easier for a lot of people. If, like me, you’ve been enjoying stuffing all of your Stories with GIFS-aplenty, then you may have had a rude awakening this week when suddenly the glorious GIF integration miraculously disappeared. After a small meltdown and a few frantic ‘force stops’ of the Instagram app, I realised that it wasn’t in fact a mistake – and there had to be a reason for the move. 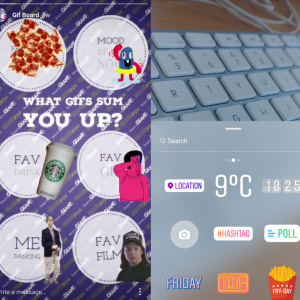 It was less than a year ago that Instagram and Snapchat added a Giphy integration to their stories features, allowing users to add GIFs from a library to their stories. Now, they’ve pulled the feature due to a user finding that a racist GIF, which reportedly appeared when you searched for the word “Crime”, could be added to posts. The user in question posted a screenshot of the offensive image and tagged Instagram founder Kevin Systrom, demanding that the GIF be removed. Find out more on the controversy on The Verge. YouTube has been at the centre of conspiracy conversations for a while now. 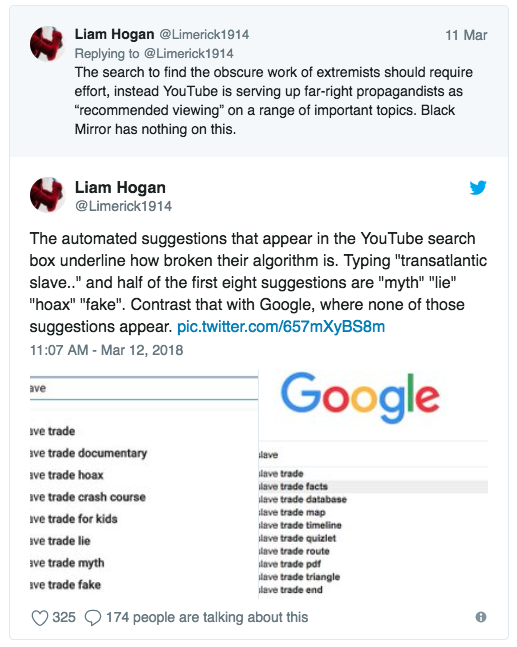 The video site, owned by Google, has been the subject of several recent tell-alls showing how it semi-promotes extreme content over more measured views. To resolve this, YouTube chief executive Susan Wojcicki announced at SXSW that the site is pairing with Wikipedia to try and curb the spread of conspiracy theories. Now, these videos will include explanations from Wikipedia pages that users can click on to learn more about the topic. Being Google owned, it’s interesting to see how drastically the auto-correct functions differ. Google says that its autocomplete feature takes into account factors like “popularity” and “freshness,” though they didn’t quite explain why YouTube differs. SXSW festival has meant tons of techie updates being announced this week, and Giphy got on board – announcing two hardware prototypes the company are currently working on. One is a Giphy Frame, a product designed to display GIF video in a two and a half millimeter thick photo frame. This, chief exec Alex Chung said, was designed to help make physical GIFs – and broach the gap between software and hardware. The second, and potentially more interesting in my opinion, is a Giphy Camera. Chung described it as a “disposable camcorder that can take and make gifs”, which can be used at parties or events to capture the moment in a whole new way. As a company of GIF lovers, and regular Giphy.com visitors on a daily (if not hourly) basis, I polled the GIANTs on whether they’d be interested in a Giphy camera. Although most of the GIANTs weren’t thrilled by the idea, it wasn’t a resounding ‘No’. A few people were interested in knowing more about how it would work, as well as how much it would cost, while others felt that there are already easy ways to do similar things – in formats like Boomerang and Whatsapp. So perhaps Giphy are trying to carve out a gap in the market that’s already been filled? Find out more on the Giphy gossip from The Drum. Google are on a roll of new features, and this week saw a few more hit the scene. One of the more serious involved Plus Codes being added to Google Maps, which use machine learning to shorten addresses and offer alternate smart addresses for a more convenient search and navigation experience. The codes feature 6 alphanumeric characters, followed by the name of the city. If you put these codes into either Maps or Google search, then you will find the exact location. These codes can be generated by each and every user, and are thought to help with offering navigation for complicated addresses – or, helping emergency services to reach afflicted locations as quickly and easily as possible. TechRadar have the lowdown on the details. When it comes to the more fun side of the changes, this week also saw Mario infiltrate apps and accompany people on the journeys. 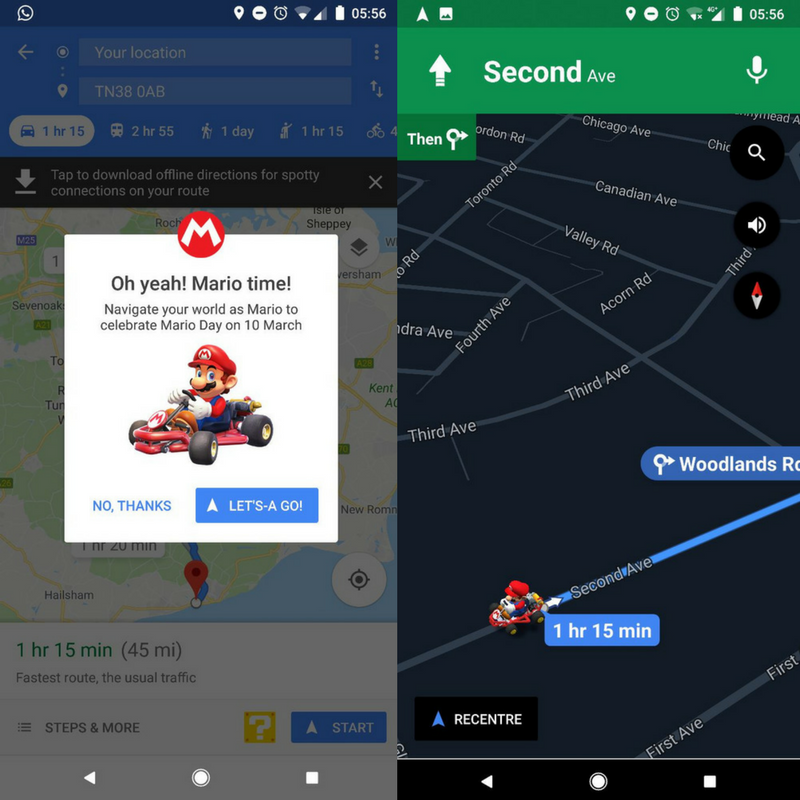 Part of a partnership between Google and Nintendo, before Mario Day last weekend, the feature allowed Maps users on iOS and Android to enable ‘Mario Time’ – which means Mario, in his little go-kart, would then guide users on their route. This is just the latest in a series of Maps partnerships, previously featuring Pac-Man and even the Loch Ness Monster; I personally like Mario Maps the most. Check out more using the #MarioMaps hashtag on Twitter, or over on TechCrunch. The Mayor of London, Sadiq Khan, made history this week as the first UK politician to be offered a keynote speaking slot at SXSW. During this, he talked about the importance of politicians doing more to protect people online and ensure that innovation benefits everyone, and said that the current trend of politicians “sitting on their hands” while the landscape changes around them needs to stop. Khan told the Huffington Post: “We simply must do more to protect people online. Social media platforms already have a legal obligation to remove content that breaks local laws. But this is not always happening, or happening quickly enough. Khan also discussed the option of following in the footsteps of the German government, which has changed the law to allow social media companies to face hefty fines if they are not fast enough at removing hate speech, fake news and illegal material. Fake news, and the impact politicians can have on the issue, is something that we have covered on multiple occasions at Sleeping Giant Media. Read about our CEO, Luke Quilter’s experience of fake news last year in London, or read our interview with local MP, Damian Collins, for his views on combating fake news. For many of us, simple things like jumping on the train or catching a bus are done without thought. Which is why it’s easy to take things for granted. Google Maps are now trying to avoid this way of thinking, and are stepping up to the plate and making sure that their software makes everyone’s lives easier. 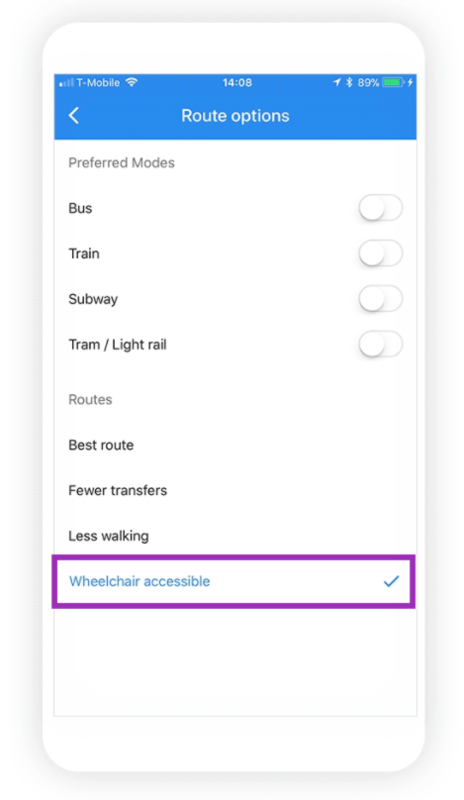 A new update to Google Maps is designed to ensure that the portion of the population who don’t find these things so easy are catered for, by introducing new wheelchair accessible routes in the Maps public transport navigation. Starting with six major cities, including Boston, London, Mexico City, Tokyo, Sydney, the feature won’t only benefit disabled people. Google highlights that it may also come in handy if you are a parent with a pram, or use crutches, for example. Find out more on Android Police. The feature was assisted by Local Guides, who helped with designating areas as wheelchair-accessible, gathering at 200 global meet ups and answering questions on over 12 million places – giving Google the information they needed to get the system live. Pretty impressive teamwork. As someone who experiences travelling with a disabled family member on a regular basis, I know how daunting it is arriving at the bottom of a seemingly-endless flight of station stairs, surrounded by the chaotic crush of commuters racing to get out as fast as possible. If this feature is rolled out, it’s about to make a lot of people’s journeys a whole lot easier. Catch us again next Friday for another instalment of our digital news roundup, or head over to Twitter to get the lowdown on what’s hot and what’s not every day of the week. Have a great weekend!